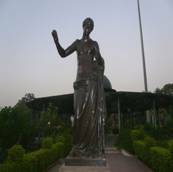 Baroda or Vadodara was the capital city of an erstwhile princely state ruled by Gaekwads.Modern Baroda is a beautiful city with its spacious parks, palaces, museums, art galleries, temple and abroad avenues. 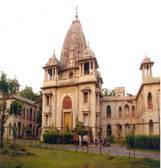 Baroda has an excellent University and its oriental institute is quite famous. Baroda has an excellent rail, road and air connections with all the major states and parts of the country. The city of Baroda is divided into two sections by the river Vishvamitri. The city is located on the fertile plain between the Mahi & Narmada Rivers. Baroda which holds a good stand in education and culture was for a long period in the reigns of Gaekwads from 1734 to 1949.It was also ruled by various other kingdoms like Hindus, Pathans, Moghuls and Marathas. The Mughals could not control the fiery independent spirit of the Marathas and the year 1721 saw Pilaji Gaekwad seizing control of the city. The city was virtually under the Gaekwads even during the British Raj.But whatever the history of Baroda is dated back to more than two thousand years. All the Indian festivals are celebrated with great enthusiasm in Baroda. The festival of Shivratri, is celebrated in honour of Lord Shiva. Holi is celebrated every year in February-March. As in the rest of Gujarat, the nine day festival of Navratri is celebrated with great fanfare. It ends with Dussehra, followed twenty days later by Diwali. The Kite festival is celebrated on 14th January each year to mark the end of winter. This festival has become an international event these days. 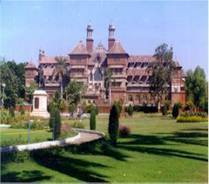 The most important historical monument in the city of Baroda is the "Lakshmi Vilas Palace". This was the palace of the Gaekwads, built by Maharaja Sayaji Rao III. 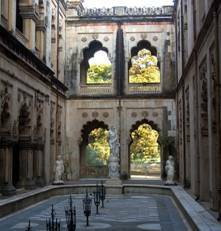 This palace boasts of an ornately decorated Durbar hall, which was used by the Gaekwads to watch live performances. The "Kirti Mandir" or the "Temple of fame". Here one would find the statues and the photographs of all royal family members. Another monument in Baroda is "The Muqabra" which is dedicated to the Moghul King Kutubudin. This is said to be one of the oldest monuments in the city. The EME temple was built by the Electrical and Mechanical Engineering Corps, and is run by the Indian army. This is the most famous temple in Baroda, which is dedicated to Dhakshinamurthy, who was a reincarnation of Lord Shiva. This temple is unique in its architecture since it has been built entirely out of aluminium sheets. The temple represents the five main religions of India. The ‘kalash’ on the top of the dome symbolizes Hinduism, the ‘dome’ stands for Islam, Christianity is represented by the ‘tower,’ the golden-structure above the tower represents Buddhism and the entrance of the temple stands for Jainism. There are other smaller temples for Hanuman, Lord Ganesh a Jain temple. The Jama Masjid mosque is one of the finest mosques in Gujarat and is situated in the town of Champaner, about 47 Kms from Baroda. There are several churches in Baroda. The Centenary Methodist church is the biggest protestant church in Baroda. It is over 100 years old. Alpha Church, Christian Brethren Assembly and Hebron Prayer fellowship are a few of the other churches. Vadodara Baroda Museum and Art Gallery exhibits a rich collection of artifacts. This collection comprises of Indian sculptures, ancient manuscripts and Egyptian antiquities. In the art gallery of this museum Mughal miniatures and works of great European masters are exhibited. 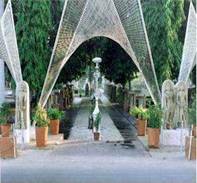 Sayaji Bagh is a major attraction in Baroda. This is a garden, with a lot of greenery, sprawling over a 100 acres and boasts of a mini rail track and a planetarium. There is a very informative show conducted here for duration of 35 minutes. This palace is known for its old classical style of architecture and it was used on ceremonial occasions by the Gaekwads. This is the residence of the royal family and was built by Maharaja Sayajirao in 1890 which is known or its Indo- Saracenic style of construction. The palace also has exhibits of bronze, marble & terracotta. Its ornate Darbar Hall has an Italian mosaic floor. This mandir built in the style of Hindu architecture has murals by the famous Indian artist, Nandlal Bose.Kirti Mandir is a magnificent stone building with domes, terraces, balconies and a central 'shikhara'. This training school of the Indian Air Force was initially a palace designed in the Italianate style. This university was built by Maharaja Sayajirao Gaekwad and it is supposed to be one of the bigger universities in Western India. 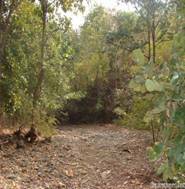 This sanctuary is known for its leopards, sloth bears, sambar, wild dogs, hyena, barking deer and a variety of birds, is situated in Bharuch district. 1. Havmor Restaurant - RC Dutt Road, Near Kala Ghoda Circle, Baroda, Gujarat. You get good silver jewellery including oxidised in Raopura, Teen Darwaza and Mandvi.Other handicrafts and handspun cotton clothes are available in the local Khadi Bhandar center.However the major part of shopping in Baroda is not complete without Camel leather and related arts of embedding pure gold and stone colors, on camel leather. The textiles showcase a distinct range of designs, colors and stitches. Sarees in Vadodara display an amazing variety with inlaid Zari works, beadwork, embellished mirrors, sequins and shells as well as tie-and-dye and block-printed designs. Vadodara shopping is very satisfying if you are in search of Patola Silk sarees, Bandhnis and traditional Gagra-Cholis, Marriage costumes, Wall hangings, Embroidered, appliquéd quilts, Cradle clothes, Cloth toys, embroidered footwear, Lacquer furniture and Curios. Vadodara is well connected by air from Ahmedabad, Delhi, Pune, Mumbai and Daman. Most of the domestic carriers operate daily flight services to Vadodara. Reaching Vadodara by rail is very easy because most of the trains pass through Vadodara. The main railway junction is situated in the Western Railway that links it with Mumbai, Delhi and Ahmedabad. Getting to Vadodara is not only easy and convenient but fun also. A host of transport facilities and services truly make a journey to this city most unforgettable experience of life. To arrive here by road you can avail any of the state transport bus and private luxury coach services from any of the numerous towns and cities of Gujarat, Maharashtra, Madhya Pradesh, Delhi, and Rajasthan.